Who Does the Gold Card Appeal to Most? Decision Time: Is Having a 24K Gold Credit Card Worth it? Getting the right type of credit card to suit your needs is very important. Different things matter to different people and there is going to be a credit card that will suit you perfectly. It just makes sense to take the time to find the right fit rather than just applying to the first credit card that you see. Those who are looking for a premium credit card that offers luxurious benefits and the best possible experience will need to be even more vigilant. Maybe you've heard of the Mastercard Gold Card? Credit cards that offer a truly premium experience are going to come with certain costs. Even so, the benefits can be very tempting. The MasterCard Gold Card is one of the most sought-after credit cards for a reason. If you need a card that is very impressive and stands out in a few ways, then you will be interested in learning more about what this card has to offer. It might be a good fit for your wallet if you can use the card to its full potential. Join us as we take a close look at everything that the MasterCard Gold Card has to offer. This will be a thorough review of the credit card and will let you know whether or not it is worth your time. Once you know everything that you need to know about the card, it will be simpler to make a smart choice. You’ll be able to see if the benefits are great enough to warrant giving it a coveted spot in your wallet. Cash back redemptions are worth 1.5 cents per point. With no introductory offer, this luxury card lacks the value of other luxury travel cards from Chase or Amex. You're basically paying $400 for the 24K gold plated card. But, if you want that shiny gold plated card, this could be perfect for you. In order to be comfortable with applying for this credit card, you are going to have to come to terms with a very high annual fee. The annual fee is currently set at $995 for this card. This is one of the highest annual fees that you could expect to pay. The high fee is supposed to be justified by offering you luxury travel benefits and a bit of a rewards program. Luxury credit cards are known to have very high annual fees so this may not come as a surprise to some. Regardless, this is a fee that is higher than many other luxury credit cards. MasterCard themselves have other luxury credit cards in the line with annual fees that are only around half of what this card costs. You may have a hard time accepting the annual fee being this high so it is automatically going to be an impractical credit card for most people. Also, if you are going to be adding users to this credit card account, then it is going to cost you money. You will have to pay an extra $225 for each additional authorized user that you put on this credit card account. If you have two or three people using the credit card accounts in your family, then this annual fee is going to pop up very high. Be prepared for this ahead of time if you want to make use of this card. That being said, the Mastercard Gold Card is very nice in many ways. You will be getting a short introductory APR period for balance transfers. For 45 days, you will not have to worry about interest on your balance transfers and that could potentially be nice. The APR after the introductory rate is reasonable on both balance transfers and new purchases so it can be a practical card to use. The other fees that you can expect to see with this credit card are fairly standard. There is a 3% balance transfer fee with a $10 minimum. You will also have a 5% cash advance fee with a $10 minimum. On a positive note, there is no foreign transaction fee that you will have to worry about. This is fantastic for people who travel abroad frequently so keep that in mind if you like to spend time outside of the country. There honestly are not a lot of special features to consider with this card. There are many luxury benefits that we will discuss later but the features of this card are fairly standard. What is interesting and worth mentioning is the overall appearance of the credit card. If you like to have your credit cards look impressive, then this one is truly going to stand out among the other options on the market. 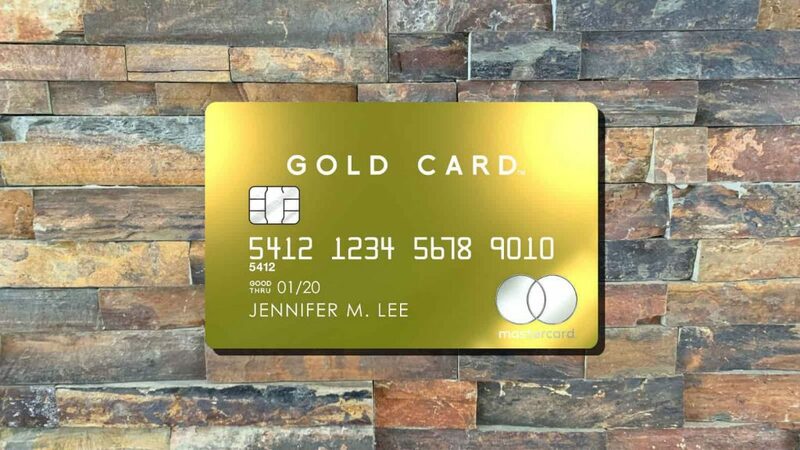 The Mastercard Gold Card credit card is 24K gold-plated and comes across as very fancy. It has a lot of weight to it as well and is one of the heavier credit cards out there. This is something that will garner some attention from people when you are using it. If you want to have a very impressive credit card, then the MasterCard Gold Card really does fit the bill nicely. Other than that, this card is mostly going to be all about the benefits that you will receive. There is a small rewards program that is kind of nice too, though. It is mostly a luxury credit card that gives off an impressive vibe. The demographic for this credit card is going to be people who are fairly well off and are capable of justifying the high fees. There are quite a few benefits that you will be able to take advantage of when you are using this credit card. Most of the benefits are going to be related to travel and some of them are quite nice. There are luxurious benefits and ones that are a bit more practical in nature. Let’s start off by highlighting some of the benefits that can help to offset that high annual fee. You will be receiving $200 in airline credits annually when you are a cardholder. These can be used to purchase airfare, to pay for baggage fees, or to buy drinks or other services while on flights. You just charge these expenses to your credit card and the charges will be credited back to your account when you still have credit to use. This is a convenient little perk that people will be able to get a lot of use out of. You are also going to be able to apply for the Global Entry or TSA PreCheck programs for free. These programs can make your travel experience a significantly easier one. They will help you to get through the screening process more quickly so that you can simply enjoy your flight. The applications for these programs are typically $100 but the fee will be credited back to your account as a benefit of membership. One benefit that frequent travelers will get a lot of use out of is the airport lounge access around the world. Being able to spend time in these luxurious lounges will make traveling that much nicer. You will even be able to bring an unlimited number of guests with you to the lounges so your traveling companions will be able to enjoy the benefits of being a cardholder as well. This is one of the perks that will likely help to sell you on becoming a cardholder. Cardholders also have access to a very good 24/7 concierge service. You will be able to use the concierge service by calling them on the phone in a traditional way or through using a messaging app. These services have been made very easy to use and they can really be quite beneficial. If you like the idea of having constant access to a concierge service, then this will be a huge benefit of membership. You will also receive certain VIP hotel and travel benefits. These benefits will range from hotel discounts to actual credits that you can use at luxury hotels. If you enjoy staying at luxury hotels while you are traveling, then this is going to be a perk that will come in handy. You can mitigate some of your costs while enjoying the VIP treatment at some of the best hotels in the world. The rewards program for this credit card is not as robust as many people would hope for it to be. You are going to be able to get 2% cash back on all of the purchases that you make. This is basically a pretty standard cash-back rate and is not anything that you will be writing home about. Even so, it is good to have access to rewards as they can help you to offset some of the costs of the card. You can redeem the points that you have earned in a few different ways. The most lucrative way to redeem rewards while using this card is to redeem points as a statement credit. This will give you an effective 2% cash-back rate. Otherwise, you can choose to redeem your points for gift cards, hotels, car rentals, or other types of merchandise. Doing this will make the cash-back rate only 1% so it is smarter to stick with the statement credit. The concierge service is very useful. The card has a rewards program. The luxury benefits of this credit card might wind up blowing you away. There are some truly good benefits that will give you the VIP treatment at many of the finest hotels in the world. Being able to get into airport lounges while traveling is another helpful benefit. This card can really improve your traveling experience so it works well for people who travel in style. Anyone who signs up for this card will love the concierge service too. This service is great and will help to make your life easier in various ways. They managed to make the concierge service very convenient for customers and you can use it frequently. You can simply chat through the messenger app to make requests or to get help with something. The fact that a rewards program exists for this card is very nice as well. You will be able to earn rewards at an effective 2% cash-back rate. This can be handy when you use the credit card often enough. It is not the highest cash-back rewards percentage out there but it is still useful when taken in tandem with the other benefits that the card offers. It is important to note just how good this card looks too. Anyone who wants to have an impressive credit card in his or her wallet will like this one. It is gold-plated and really feels as if it is a classy, luxurious item. If you like being able to impress others, then you just may want to have this credit card in your wallet. The annual fee is very high. It has other associated fees to worry about. The rewards program could be better for the money. The high annual fee of $995 is going to be quite difficult for many people to justify. If you are worried about the annual fee, then this card may not be aimed at you. It is a luxury credit card that is going to offer many amazing travel benefits to cardholders. If you travel a lot and stay at luxury hotels, then the cost of this card is going to pay for itself over time. Other associated fees may prove to be bothersome as well. You have a 3% balance transfer fee to think about and a 5% cash advance fee. These are fairly standard fees but they do still exist and may deter some people from applying for the card. Most people who want a luxury credit card will not scoff at these types of fees, though. One disappointment is that the rewards program is not as lucrative as it could potentially be. If you want to get ample rewards from your credit card experience, then you may wish to look elsewhere. The rewards potential of this credit card is pretty much middling at best. 2% cash back is nothing to turn your nose at but it may not be quite enough for many people. In order to qualify for this credit card, you are going to need to have a high credit score. Try to make sure that you have a score in the excellent range if you want to add this card to your wallet. Scores in the high 700s will have better chances of being approved. Do your best to check your scores ahead of applying so that you will know your chances of approval and can avoid any disappointment. A credit card such as this is going to appeal to a few different types of people. The first type of person that this appeals to is someone who wants an impressive credit card. This card is gold-plated and looks very luxurious. It has a certain vibe that is going to match up well with the desires of many people who are seeking a high-end experience. Those who want to have luxury travel perks will also love this card. It gets you access to airport lounges around the world and offers you many hotel benefits too. If you are a cardholder, then you will be able to make use of this card to improve your travel experience. It really does make a difference to be a cardholder so this makes sense for certain types of people. Anyone who is worried about spending money will likely not want to apply for this card, though. If the thought of spending $995 on an annual fee worries you, then you likely are not the target demographic for this card. There are other options out there that offer similar perks that will come with more reasonable annual fees. Looking into your other options may be beneficial when you are very budget-conscious. You may want to consider The Platinum Card from American Express as an alternative. This card offers similar rewards and travel benefits. Some may even find that the airport lounge selection is superior when compared to the MasterCard Gold Card. The annual fee for the Platinum Card from American Express is much more reasonable and you will still be able to enjoy luxurious rewards. See our full review of the Amex Platinum Card. The card itself is not as impressive as the 24K gold plated MasterCard Gold Card, though. If part of your reasoning for getting a luxury credit card is the overall aesthetics of the card, then it may not be everything that you want. That being said, it is a better value in regards to travel benefits and rewards. Consider the factors that matter to you and make an informed decision. Taking the time to sign up for the MasterCard Gold Card may be worth your while. This is a luxury travel credit card that offers many amazing perks. If you like being able to stay in fancy hotels and have access to nice airport lounges, then the benefits of the card will be apparent right away. You can improve your travel experience substantially if you decide to apply for this card. People who want a more robust rewards experience may want to turn elsewhere. The Mastercard Gold Card is not perfect in every way but it does do some things really well. Aside from that, it is also a very impressive card visually. It might work out well for your needs if you are able to take advantage of what it has to offer.